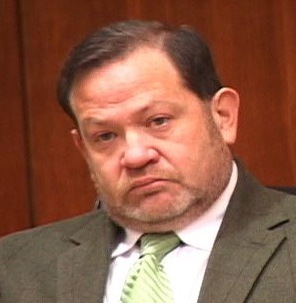 UPDATE: Video of the confrontation between supervisors Adam Hill and Lynn Compton at the San Luis Obispo County Board of Supervisor meeting on July 19 at the bottom of the article. ORIGINAL: Following a brief argument between supervisors Adam Hill and Lynn Compton, the San Luis Obispo County Board of Supervisors voted for a final time on a countywide transportation tax. The half-cent sales tax initiative will now appear on the November ballot. As it did one week ago, the board voted 3-2 on Tuesday to place the tax measure on the ballot. Supervisors Bruce Gibson and Frank Mecham joined Hill in voting in favor of placing the initiative on the ballot. Compton and Supervisor Debbie Arnold cast the dissenting votes. The proposed tax would last nine years and raise approximately $25 million annually for transportation projects and traffic reduction efforts. Fifty-five percent of the funds raised is supposed to go to local agencies for transportation projects; 25 percent is supposed to be used to reduce traffic on major roadways and highways; and 20 percent is supposed to be spent on countywide transportation projects, including improvements to bike and pedestrian paths. Two thirds of county voters would have to support the initiative in order for it to pass. Proponents of the tax argued that our infrastructure is failing and we cannot count on Sacramento. Opponents of questioned the $400,000 to $600,000 cost of bringing the new sales tax measure to the voters, money they said could be spent on roads, and that Sacramento should be held accountable for managing transportation funding. Before Tuesday’s votes, Hill attacked two critics of the tax measure: former Congresswoman Andrea Seastrand and Coalition of Labor, Agriculture and Business (COLAB) spokesman Mike Brown. Hill said it was ironic they were opposing the tax because Seastrand served as the head of the California Space Authority, which spent taxpayer money, and Brown headed the Santa Barbara County government, which had its own sales tax. Compton responded by saying it is inappropriate for Hill to attack members of the audience who take time out of their day to speak before the board. “I think it’s completely inappropriate, and I am going to call for you not to do that anymore,” Compton said. Hill shot back at Compton, calling her a hypocrite while she was still speaking. “You don’t ever say anything when people personally attack me or Supervisor Gibson,” Hill said. Hill has argued repeatedly with Compton and Arnold over the tax measure. Hill has said voters should have a say on the matter, and the county needs the tax revenue because the state and federal governments have cut transportation funding. Arnold and Compton have said they do not want to burden county residents with any more taxes. They have also said the state should not be rewarded for mismanaging transportation funding. Mecham, who has at times been the swing vote on the board, took the position that the voters should decide on whether or not the county adopts a transportation tax. Critics have called Mecham’s position a cop-out. All seven city councils in the county have already approved the tax initiative. The San Luis Obispo Council of Governments, the agency that initially called for the initiative, has also approved the tax measure. If voters approve the measure, the sales tax rate would increase to 8 percent in unincorporated areas of the county and to 8.5 percent in the cities. Each of the cities already have their own half-cent sales taxes. This tax wil not pass with 2/3 vote. The Board of Supervisors is wasting another $500,000 dollars of OUR funds. Ridiculous! Adam Hill always reminds me of the fat guy from the movie Deliverance – the one that gets buggered in the woods and made to “squeal like a pig”. C’mon Adam, squeal like a pig. Stupid Frank Meecham. He has turned into Adam’s little brother. As for Adam, please come harass my wife or myself and I will be glad to accommodate you. You are a no good fat pig. How many people would be on the list of people that have been attacked, harassed, threatened or defamed (verbally, written, or otherwise) by any member of Team Adam Hill? How many people harmed does it take to file a class action law suit? I just can’t vote for this tax increase either, it is a good idea though, why,because everybody pays not just the locals,anyone passing thru SLO county pays the tax,thats the only good thing, the down side is the clowns we have elected can not be trusted and the ones we haven’t elected, slocog, or what ever it is,these people just piss our monies away on new hires,more studies,and lets not forget green paint for the bikes,enough is enough,just say no,and please 3rd district get rid of A Hill. This new proposed county 1/2 percentage sales tax is not the answer. We are already paying state taxes to care for road infrastructure. The Guv and State Legislature raided the dollars funds for road infrastructure and using those dollars for their other pet projects. It’s a scam on the taxpayers. It is a spending problem and not a revenue problem. Senator Monning needs to start ‘feeling the heat’ as he runs for re-election for State Senate! Keep in mind that this tax will be PERMANENT. The expiry is just a selling point like the City of SLO used. Then when the tax is within a couple years of expiring it will be a looming crisis with devastating consequences unless renewed. And as always the proposed cuts will be to the law enforcement, parks, public works, never to waste or welfare. I had heard people from the County explain the strategy; you have to make it hurt the people who pay taxes the hardest. The County ended mosquito abatement, a basic function of government, because people rejected a special tax for a program that is one half of one tenth of one percent of the County budget or one two thousands. Even liberal former Supervisor Peg Pinard thought the tax was ludicrous and wrote an editorial against it. Now the County has a healthy surplus. Will they put the $230,000 for mosquito abatement back in the budget. NO. You must continue to be punished for voting down the tax.